You have suffered a life so that I could gain a longer one. I didn’t know when they were trying to heal me that you would suffer so terribly. I don’t think I would have changed that, if I had known, saying goodbye forever wasn’t an option. I am sorry that you are broken. It would have been a better time if I had lost that 20 kilos a few years earlier. That time was hard for me and I wasn’t thinking about how I would hurt you. I am sorry that I didn’t wear more supportive shoes, that would keep you out of harms way. I love walking and would run when I was younger. If I had known I would have made it different for you. I am sorry that I didn’t tell anyone about you, when I had that car accident and you smashed into the glove box so hard, you cracked it. I didn’t want anyone to find anything wrong with me because I didn’t think I was worth it. Thank you for being there for me and now as it has become really hard for you to get me around, you just do it. I feel your reluctance to move in the morning and I thank you for keeping me going. Thank you for allowing this year to be so much easier and allowing me to walk more. Thank you for helping me keep up with Fern. Our goal is to get us both through our trip to the UK before we say goodbye. You have served me well even when I have let you down. I promise I will continue to massage you each day, so we can spend this time together with some blessings to get us through the day. 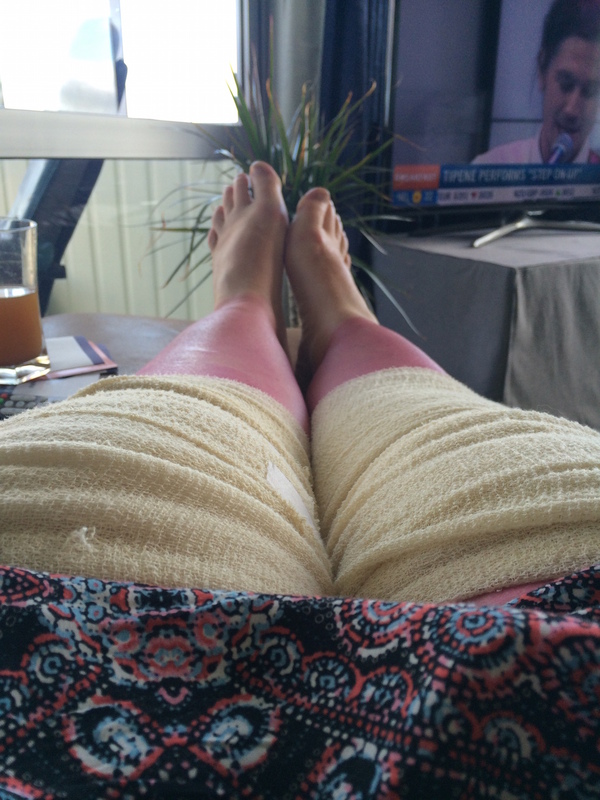 I understand how you feel….my knees give me problems from time to time. Hope your knees get better soon. My mother had her right knee done a few years ago and she vowed to never ever do the other one. Here’s to a speedy recovery! Hope they are better soon! No hope for a knee replacement? If you can, get them both done at once (per my father in law, who said he now understands why people who do only one at a time never go back). The rehab is slightly longer than doing one, but when you look at how much time it takes to rehab each time, it’s worth it. Good luck! Oh how I wish I hadn’t done the things I did to my body…. It’s a nice idea. Pray your knees get better soon. This is so touching….. Hope you feel better soon hon. While you at it, massage your back! You can reach the lower back with your arms. For the whole back and shoulders, wrap a baseball bat in a towel. Place on the floor and roll gently over it, up and down.